William is our awesome introvert. If you’re able to earn his trust, he’ll reveal two things to you in no time: (1) his encyclopedic knowledge of sea creatures, especially sharks, and (2) his clever, understated sense of humor. 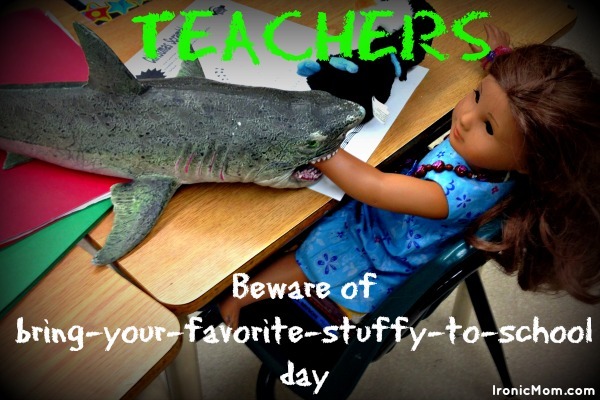 A while ago, it was bring-your-favorite-stuffed-animal-to-school day. Sometime around noon, I received an email from William’s teacher. She said she came across this crime scene and knew she had to photograph it. Unbeknownst to anyone, William set up the props at a group of desks just as he and his classmates when off to gym. Will’s teacher emailed me the above photo (aptly named “nom nom nom”). It made me laugh. I hope you enjoy it too. Feel free to caption the photo in the comments. Or let me know what your favourite stuffed animal/doll/action-figure-thingie was. So funny. I showed this to my kids and they thought it was hysterical. Thanks for the laughs! I love that his teacher emailed you. WOW! And I snort-laughed at the photo. That William – guess he comes by funny honestly, eh? I try to email parents of my students all the time, but getting an email is like pulling teeth. So I started stamping my email address on report cards and progress reports. On the other hand, my child’s teachers resent the fact that I email them and demand a timely response. She goes to a stuffy private school for which I regret selecting, but with one more year, it’s a wrap. They are antiquated and really don’t appreciate parent interference unless it is to do lunch duty or run the current fundraiser. That teacher is my soulmate. William sounds like an awesome kid whose teacher really “gets” him. Best thing I’ve seen today.